Amazing footage of big wave windsurfing icon Jason Polakow's first video podcast, shot during the March swells at JAWS. March 15th at Piahi delivered the best conditions that Jason Polakow scored this winter. One of KA-1111's best days in Jaws with huge aerials and high speed carving bottom and top turns. The video demonstrates that Jason attacks the lip harder than anyone, sails closer to the critical section of the wave and that he is ready to pay the price for his style to constantly push his personal limits - which are the benchmark at Jaws. Simply impressive! Jason: "Since my first encounter with Jaws some 20 years ago, my life has forever been changed. It's kind of strange how one wave can shape your life and become your sole obsession." A New Zealand repair man is on his way to Antarctica after a renegade Norwegian yachtsman set sail unaware he was still on board. The marine mechanic was reportedly working on an anchor aboard the 54ft Nilaya in Auckland harbour, when the yacht hurriedly cast off as immigration officials tried to serve deportation papers on the skipper, Jarle Andhoy, 34. "the Nilaya was not carrying a locator beacon so it would not put rescue services at risk"
They are trying to track down the Nilaya. Mr Andhoy told the Norwegian public broadcasting service NRK that the presence on board of the unnamed New Zealander was not part of his plan, but was the result of "a hectic departure" from Auckland last week. He said it was "a somewhat tricky situation" because the man did not have a passport or papers with him. But Mr Andhoy insisted: "Everything is on schedule and the atmosphere is good on board. "We are well prepared for what may befall us." Murray McCully, the New Zealand foreign minister, spoke to Norwegian government officials on Tuesday to express concern over the Auckland man understood to be on board. "It's fair to say the actions of the skipper are of some concern to the New Zealand government and have been for some time," Mr McCully said. A Foreign Ministry spokesman added: "The Southern Ocean is one of the most remote and inhospitable areas in the world. Marine experts said the workman was unlikely to have adequate clothing and would put an extra strain on the yacht's provisions. Microscopic algae create a bright blue in a new photo snapped by a European Earth-observing satellite. Photosynthesizing micro-organisms called phytoplankton created the figure 8 in the south Atlantic Ocean, about 360 miles (600 kilometers) east of the Falkland Islands. 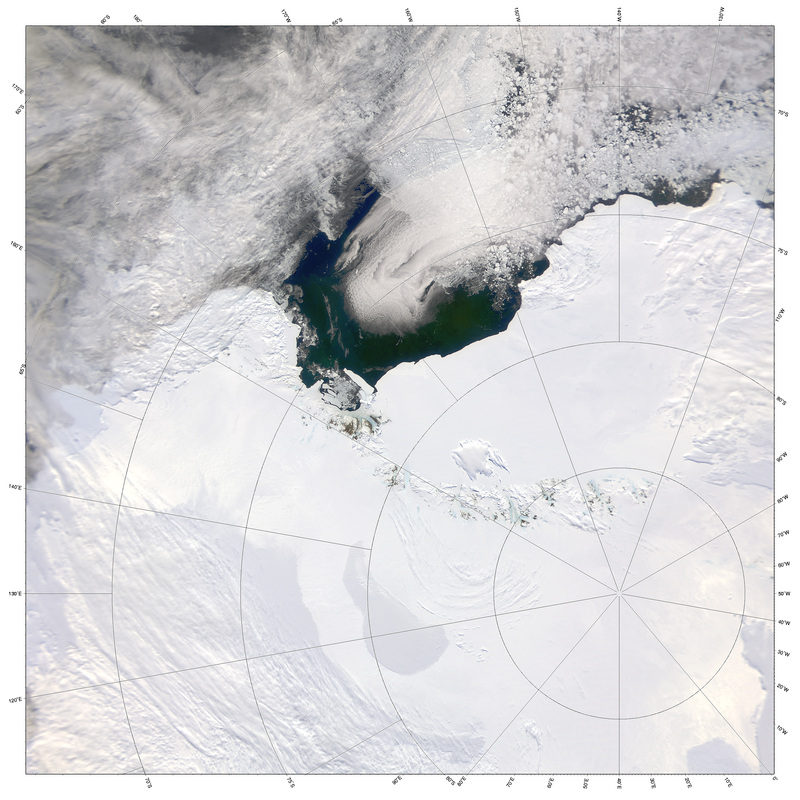 The European Space Agency's Envisat spacecraft acquired the image on Dec. 2, 2011. Such oceanic algal blooms are common in the Southern Hemisphere's spring and summer, when upwelling brings minerals from deeper waters to the surface, researchers said. Phytoplankton depend on these minerals, and the organisms proliferate as a result. 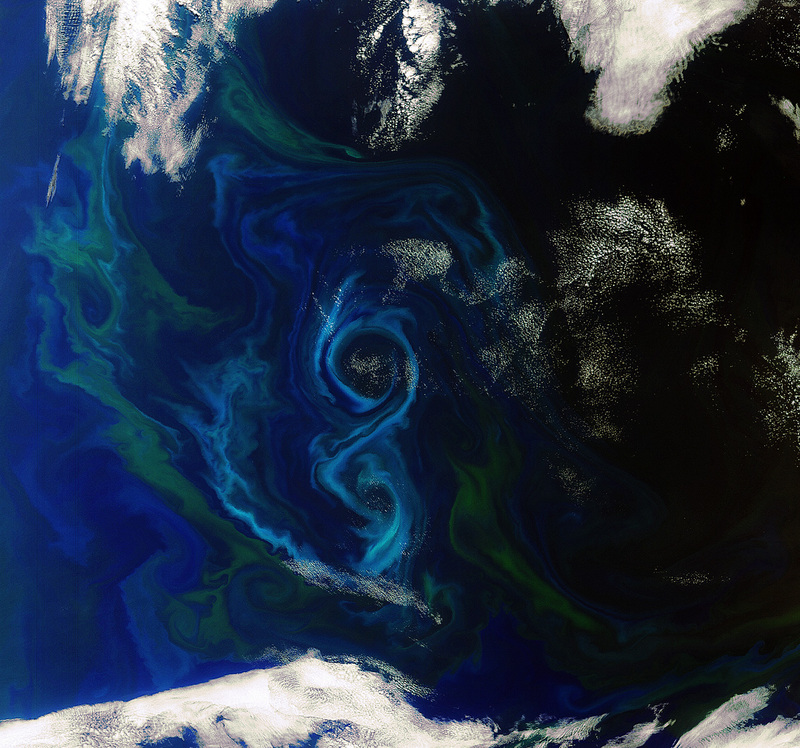 Different types and quantities of phytoplankton produce blooms of different colors, such as the blues and greens seen in the new image. By analzying such satellite pictures, scientists can monitor blooms and get an idea of the species involved. Some algal blooms can be toxic, poisoning fish and other marine animals on a large scale. When they occur in coastal waters, such harmful blooms are often referred to as "red tides," and they can affect fisheries and human health. Phytoplankton form the base of the marine food chain, and they play a huge role in the removal of carbon dioxide from the atmosphere and the production of oxygen in the world's oceans. So scientists are keen to monitor these tiny organisms, to get a better idea of ecosystem health and to monitor possible impacts of climate change. The 8.8-ton Envisat spacecraft, which launched in 2002, is the largest non-military Earth-observing satellite ever built. The $2.3-billion craft carries a suite of 10 different instruments, with which it monitors the planet's land, oceans, atmosphere and ice caps continuously. Envisat snapped the new photo with its Medium Resolution Imaging Spectrometer (MERIS), an instrument that measures the solar radiation reflected by Earth. MERIS images have a resolution of 1,000 feet (300 meters). 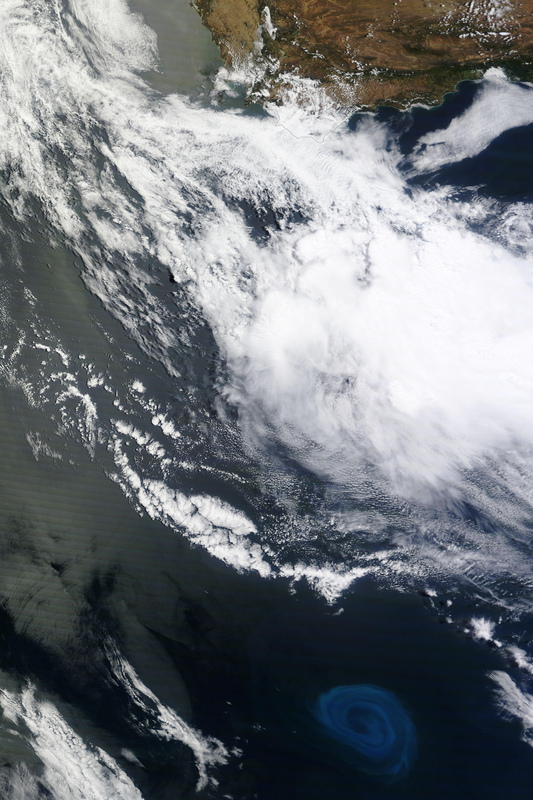 The ocean has storms and weather that rival the size and scale of tropical cyclones. But rather than destruction, these storms—better known as eddies—are more likely to bring life to the sea...and often in places that are otherwise barren. The Moderate Resolution Imaging Spectroradiometer (MODIS) on NASA’s Terra satellite captured these natural-color images of a deep-ocean eddy on December 26, 2011. The top close-up shows the vortex structure of the eddy, traced in light blue by plankton blooming in the 150-kilometer wide swirl. The lower, wider view shows the bloom and eddy in context, about 800 kilometers south of South Africa. “Eddies are the internal weather of the sea,” says Dennis McGillicuddy, an oceanographer at the Woods Hole Oceanographic Institution. They are huge masses of water spinning in a whirlpool pattern—either clockwise or counterclockwise—and they can stretch for hundreds of kilometers. Eddies often spin off from major ocean current systems and can last for months. In the image above, the anti-cyclonic (counter-clockwise) eddy likely peeled off from the Agulhas Current, which flows along the southeastern coast of Africa and around the tip of South Africa. Agulhas eddies, or “current rings,” tend to be among the largest in the world, transporting warm, salty water from the Indian Ocean to the South Atlantic. Certain types of eddies can promote blooms of phytoplankton. As these water masses stir the ocean, they draw nutrients up from the deep, fertilizing the surface waters to create blooms of microscopic, plant-like organisms in the open ocean, which is relatively barren compared to coastal waters. In satellite observations of sea surface height and in computer models, eddies appear as bumps or depressions in the ocean, indicating the upwelling or downwelling of water. They also can be distinguished by higher or lower surface temperatures. However, such observations were not available for the eddy depicted above. A State library exhibition of the mapping of Antarctica from the 15th to the 21st century, from crude woodcut maps to the latest satellite imagery. Antarctica is regulated by the Antarctic Treaty which applies to the area south of 60° South Latitude, including all ice shelves and islands. The original signatories in 1959 of United Kingdom, South Africa, Belgium, Japan, United States of America, Norway, France, New Zealand, Russia, Argentina, Australia and Chile have been joined by many other States. Now, numerous signatories agree to prohibit military activity, except in support of science; prohibit nuclear explosions and the disposal of nuclear waste; promote scientific research and the exchange of data; and hold all territorial claims in abeyance. Many of these countries also have an interest in Antarctic conservation as shown by membership of the Convention on the Conservation of Antarctic Marine Living Resources (CCAMLR) 1982. Antarctic Regions. Maps showing present state of research. By J.G. Bartholomew. F.R.S.E. 1898. Antarctica is the highest, driest, coldest, windiest continent. The region around Antarctica, called the Southern Ocean, is open with no boundaries; the Antarctic Circumpolar Current flows towards the east, driven by westerly winds. The only partial obstruction is the Drake Passage/Magellan Straits, between Cape Horn (at the tip of South America) and the Antarctic Peninsula. Thick ice sheets flow off the coast of Antarctica and break away to form icebergs that are carried north into the basins of the Pacific, Indian and Atlantic Oceans. The land has small mosses and lichens but no higher plants while the oceans contain a rich and diverse life with the better known whales, seals and penguins as well as icefish, starfish and sea urchins. The only places where people live are bases or stations, usually operated by national governments. The scanned Mediterranean coast with assigned place mark to each aggregation of fish cages. demonstrate the reliability of recent FAO farmed fish production statistics for the Mediterranean as well as the promise of Google Earth to collect and ground truth data. Accurate reporting of quantities of wild-caught fish has been problematic and we questioned whether similar discrepancies in data exist in statistics for farmed fish production. In the Mediterranean Sea, ocean fish farming is prevalent and stationary cages can be seen off the coasts of 16 countries using satellite imagery available through Google Earth. Using this tool, we demonstrate here that a few trained scientists now have the capacity to ground truth farmed fish production data reported by the Mediterranean countries. The Great Wall of China is not the only thing you can see from space. 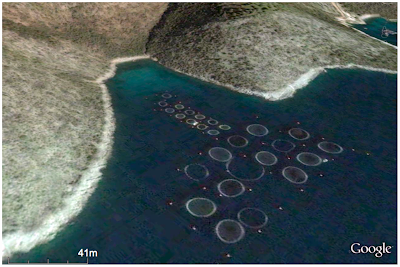 Fish farming cages are clearly visible through Google Earth's satellite images and University of British Columbia researchers have used them to estimate the amount of fish being cultivated in the Mediterranean. With Google Earth, we could examine 91% of the Mediterranean coast and count 248 tuna cages (circular cages >40 m diameter) and 20,976 other fish cages within 10 km offshore, the majority of which were off Greece (49%) and Turkey (31%). Combining satellite imagery with assumptions about cage volume, fish density, harvest rates, and seasonal capacity, we make a conservative approximation of ocean-farmed finfish production for 16 Mediterranean countries. "Our colleagues have repeatedly shown that accurate reporting of wild-caught fish has been a problem, and we wondered whether there might be similar issues for fish farming," says lead author Pablo Trujillo, an Oceans Science Advisor for Greenpeace International, who conducted the study while a research assistant at the UBC Fisheries Centre. "We chose the Mediterranean because it had excellent satellite coverage and because it was of personal interest," says Chiara Piroddi, co-author and an ecosystem modeler at the UBC Fisheries Centre. "We hand counted 20,976 finfish cages and 248 tuna cages, which you can differentiate due to their extremely large size – each tuna cage measured at more than 40 metres across." Almost half the cages were located off the coast of Greece and nearly one-third off of Turkey – and both countries appear to underreport their farmed fish production. The researchers note that not all areas had full satellite coverage – for instance, images were missing for large portions of the coasts of France and Israel, for reasons the authors do not fully understand. Combining cage counts with available information on cage volume, fish density, harvest rates, and seasonal capacity, the research team estimated ocean finfish production for 16 Mediterranean countries at 225,736 tonnes (excluding tuna). The estimate corresponded with government reports for the region, suggesting that, while there are discrepancies at the level of individual countries, overall, the Mediterranean countries are giving accurate counts. "The results are reassuring, and the methods are inspiring," says co-author Jennifer Jacquet, a post-doctoral researcher with UBC's Sea Around Us Project. "This shows the promise of Google Earth for collecting and verifying data, which means a few trained scientists can use a freely available program to fact-check governments and other large institutions." The mystery behind the avian outbreak that inspired one of Alfred Hitchcock's greatest films may have finally been solved. 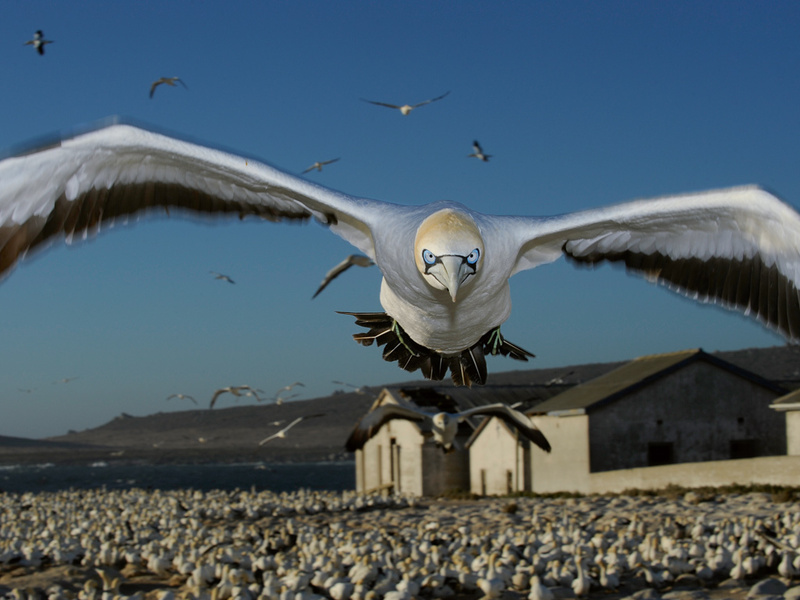 Hitchcock's 1963 film "The Birds" was inspired by both a Daphne du Maurier short story and a mass outbreak of avian insanity that took place in California's Monterey Bay two years earlier. According to a team of researchers, that outbreak was caused by the least suspenseful thing of all time: poisoned plankton. Sibel Bargu of Louisiana State University led a team of researchers that determined that 79 percent of the plankton that the squid and other creatures that the birds ate contained toxin-making algae, which was passed along through prey to predator. In the film, the birds attack people, while in real life they suffered seizures and confusion and then died, plummeting down on houses and cars when they dropped from the sky. As USA Today points out, the poison may have been caused by leaky septic tanks in the rapidly expanding housing market in the area, giving the story a moral lesson after all.